Need a quick weeknight meal that is full of veggies and protein? This is the dish for you. It is very simple to put together and it will make everyone in the household happy! Kids will love that it has noodles and it’s a great way to sneak in the veggies. You can also prep the veggies the night before to save some time next day! Give it a try and let me know what you think! Marinate the steak for at least 15 minutes in the ginger paste, minced ginger, soy sauce, 1 tbsp sesame oil, and the minced garlic cloves. 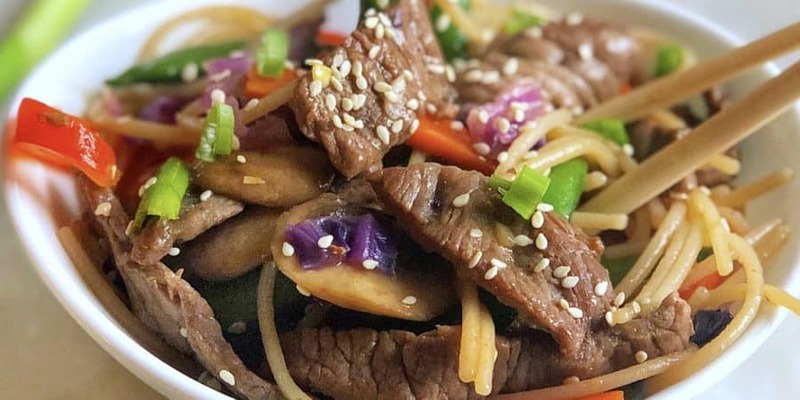 Cook the beef in 2 tbsp of sesame oil to a wok or large skillet. Cook meat for 3-5 minutes max. Then drain off the liquid. You can toss the liquid away. Set aside the beef. In the same wok/skillet, add another 2 tbsp of sesame oil then add all the veggies and saute for about 7 minutes. Season well with salt. The veggies should still have a snap to them but be tender as well. Now add the beef and cooked noodles to the veggies. Then add in the sauce and mix together for a few minutes. Top with sesame seeds and green onions for garnish. Mix all the sauce ingredients together very well.